That is the recipe to combat hunger for Ms Sekai Kobayashi, 33, a former engineer who will not turn away penniless customers at her restaurant Mirai Shokudo (translated as Future Eatery) in Tokyo. There is no staff other than her at the eatery, which seats 12 at a counter. Customers have the option of paying for food or earning a free meal by serving dishes, clearing tables and performing other tasks. So far, more than 500 people, including university students, have opted to work for their meals to save money, among other reasons. Those who contribute their labour can either dine for free or receive a free-meal coupon that can be deposited at the restaurant’s entrance for anyone to use. 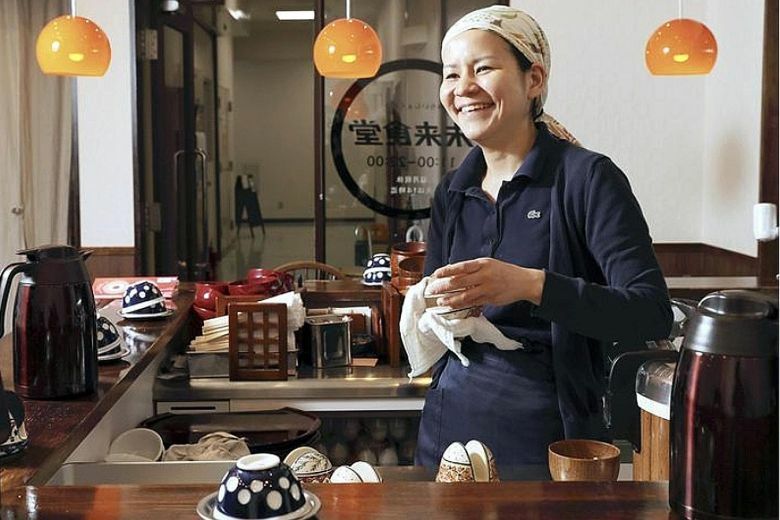 Ms Kobayashi opened the restaurant two years ago in the city’s Jinbocho district, aiming for “a place where everyone is welcome and everyone fits in”. “Through various methods, I’ve also kept the business profitable,” she said of her business, where the daily lunch special is priced at 900 yen (S$10.50). “I dabbled in shop management as a university student. Each year at the university’s annual festival, I ran a dimly lit cafe stocked with books,” said Ms Kobayashi of her initial foray into the food and beverage (F&B) trade. “The cafe won first prize in the festival popularity contest in all four years when I was a student. I even opened cafes at other school festivals,” she added. After turning 20, she worked at a bar in Shinjuku’s Golden Gai – a district in Tokyo known for its cosy bars and pubs – and other places. After graduating from university, however, she found a non-F&B job because a bar master told her that “it’s not so bad to experience the outside world”. She worked as an engineer at IBM Japan, then moved to Cookpad, which runs a cooking recipe site. The company had an in-office kitchen where everyone could prepare and eat meals. “My colleagues really liked the lunches I made for them. This led me to strongly consider opening my own restaurant,” she recalled. She enrolled for vocational training at a leading restaurant chain and other places before opening Mirai Shokudo. But her engineering roots have not gone to waste. “To manage my restaurant, I adopted an open-source model – a system through which software design is made available for free to the public so that everyone can improve upon it. “I posted the restaurant’s business plan and finances on its website so I can collect input from the public on how to make improvements. This information is also available for those who want to open their own restaurants. “Sharing something with others means supporting those with ambition. That underpins my approach to work,” she said. A 56-year-old former teacher has regularly helped at the restaurant since the end of July. “It’s an exciting job because I work with a new person every time. It’s interesting to develop a good rapport and work with others,” said the woman, who hopes to carve out a new career in the food industry.